The thrill of simulation gaming is how much it feels like the real thing. Once just toys, these days racing wheels and flight controllers offer the player remarkable realism. However, if you want to take it even further, a Playseat can push your simulation immersion level right into the stratosphere. A Playseat transforms your office into a cockpit, or your living room into a race car. The Playseat features a robust and stable metal frame and a well thought out design that makes this game cockpit comfortable, responsive and unique. Playseat cockpits include a folding mechanism for added strength and durability. The foldable seat is combined with a fully adjustable steel frame that you can custom fit to your favourite height, length and depth. This complete adjustability means your Playseat will work with almost every computer or console game, player or controller. These adjustable cockpits also feature firm mounting points that hold your simulation controller steady for twisty tracks or spiralling dogfights. The Playseat places your wheel, pedals, stick or yoke just where you need them for maximum control, comfort for long hours of game play and totally immersive realism. Finally, joysticks, driving wheels and pedals feel firm and truly life like! 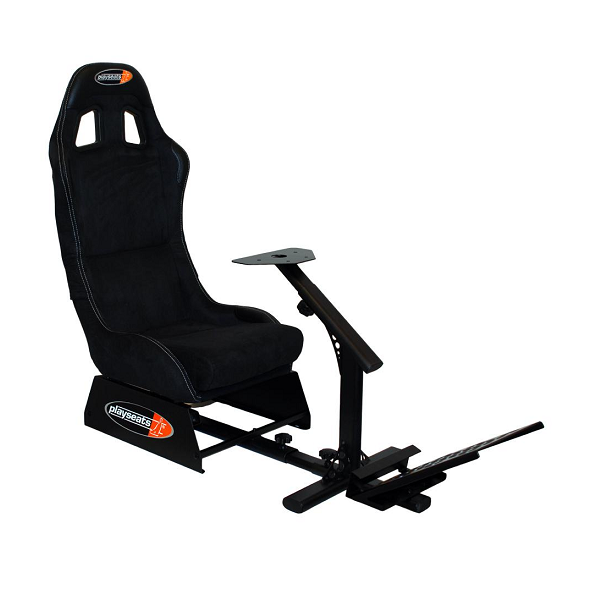 * Playseat is perfectly stable; do not worry about braking, banking or steering hard. * Comfortable seat with fully adjustable player position. * Changing player position takes seconds. * Suits player heights from 120cm thru 220cm. * Suits player weight to 112kg. * Easy to assemble and quick to disassemble. * Foldable seat for easy storage when not in use. * Compatible with game consoles and computer systems. * Compatible with a wide range of joysticks, yokes, pedals and wheels. * Includes screws to fix gaming peripherals to the Playseat.